Do you want to grow your own food, but worry that you don’t have time to tend to a garden? 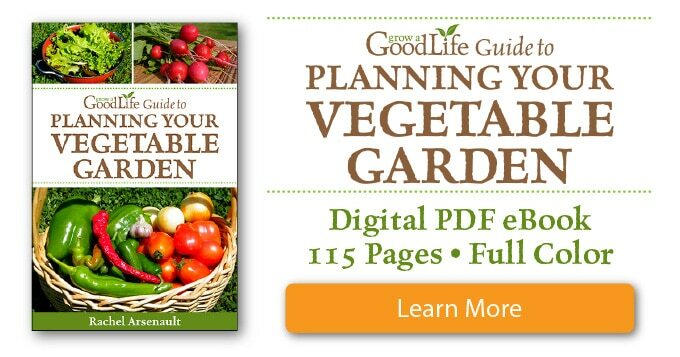 These tips will help you plan a low-maintenance vegetable garden that will reward you with fresh food throughout the garden season. There are many benefits of growing your own food, including amazing flavor and nutrition, avoiding pesticides and chemicals, and saving money at the grocery store. 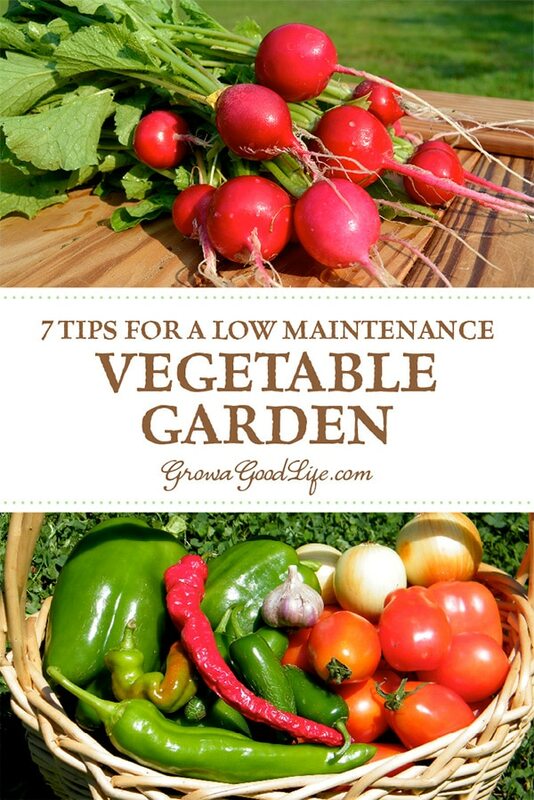 If you are not convinced, read 10 Reasons to Grow Your Own Food for more encouragement. Many people would love to grow their own vegetables. Unfortunately, life is busy for most of us. Getting started is daunting, and many worry about adding one more thing to their routine. Gardening can be an enjoyable and rewarding hobby if you plan it right. Begin a smaller-scale garden instead of a large one. You can always expand in the future. Plus it is easier to learn about your unique growing area and how to care for your garden on a smaller scale. There is no reason to put the energy into growing a crop if no one eats it. 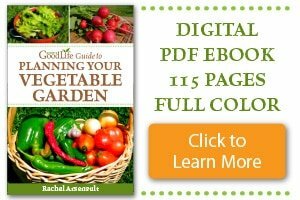 Consider growing vegetables based on what you and your family like to eat. When you purchase produce from the grocery store or farmers’ market, what to you pick up week after week? 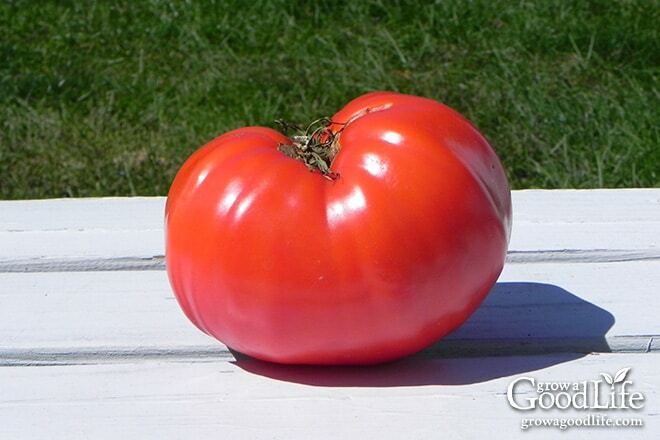 If you love salads, then tomatoes, greens, and lettuce would be obvious choices to grow in your garden. 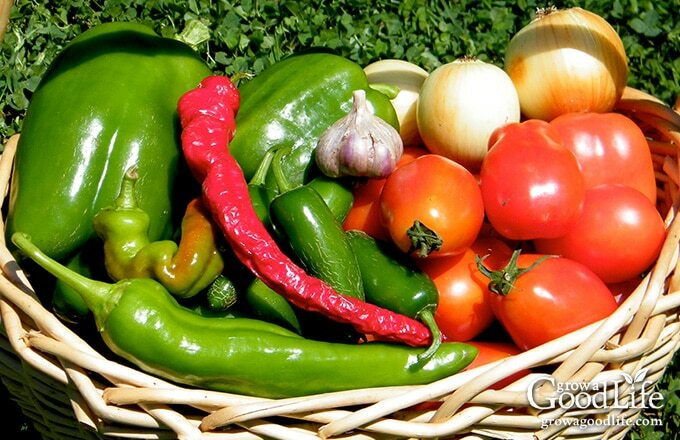 If you enjoy fresh salsa, then peppers, onions, tomatoes, and cilantro should be on your list. 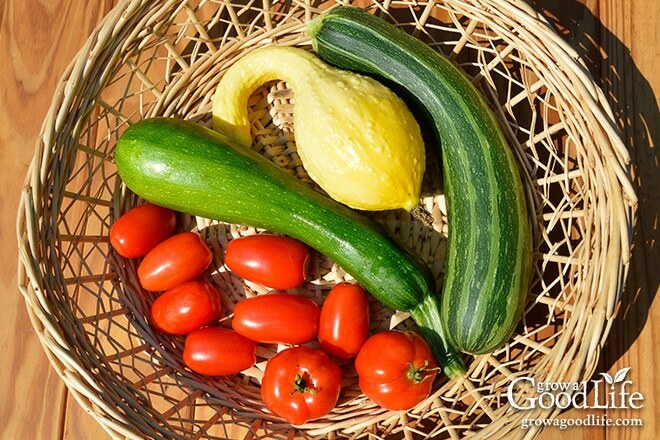 Vegetable gardening is fulfilling when you are rewarded with foods that you enjoy. Raised-bed gardening is a great way to grow vegetables. 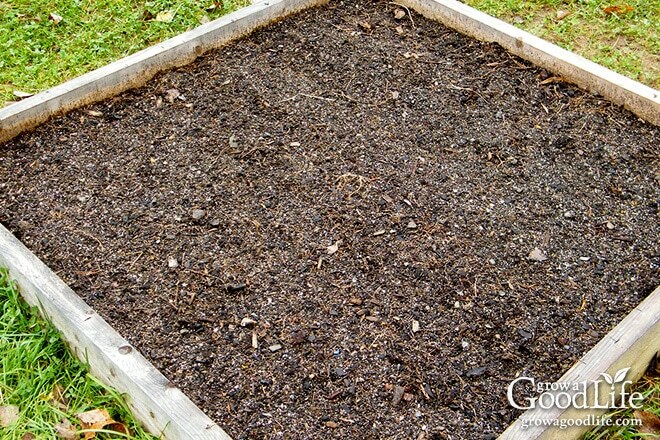 You don’t have to worry about digging a garden because the raised beds are placed on top of the ground. The square foot garden concept is a quick and organized way to get a garden started. You simply build a raised bed out of 2 x 6 inch boards, layer cardboard on the grass, fill the bed with a growing mix, and plant right away using the charts in the book. Since you begin with fresh, nutrient-rich soil, you often don’t have to worry much about weeds for the first few years. Growing in raised beds with healthy soil also allows you to plant closer, which helps shade the soil preventing moisture loss. 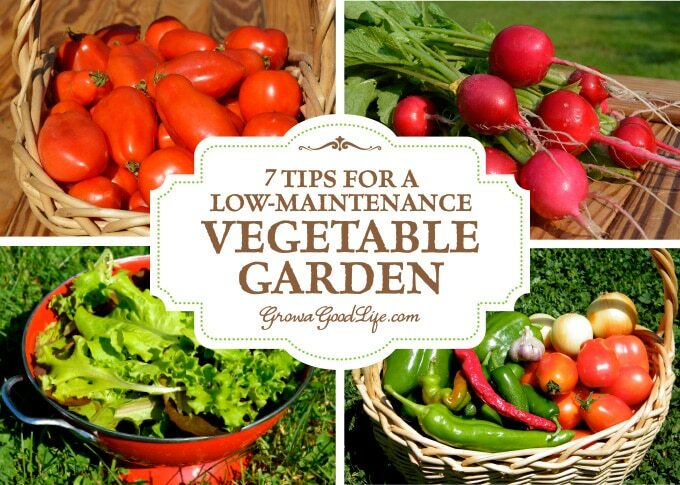 Grow vegetables that are easy to maintain and won’t need a lot of attention other than watering and harvesting. There are two different types of vegetables: cool season and warm season. Cool season crops can handle light frosts and thrive in the cooler part of the growing season in early spring and fall. Warm season crops need both warm soil and high temperatures to grow and produce fruit. They are killed by frost. Plant them after the last frost in spring (look yours up here: PlantMaps.com). Cool Season Crops: Consider these cool season vegetables for spring and fall: beets, carrots, kale, lettuce, radishes, spinach, chard, onions, peas, and potatoes. Warm Season Crops: Try growing these warm season crops in summer: bush beans, cucumbers, peppers, bush tomatoes, and zucchini. Herbs: Fresh herbs add lots of flavor to meals, and they are easy to grow. Many herbs are perennials, which means they come back year after year. Some examples of perennial herbs include oregano, parsley, thyme, sage, mint, and marjoram. Other easy herbs to grow include parsley, cilantro, and basil. Starting transplants from seed can be fun, and you will have more variety to choose from. However, it does require some time to sow and care for the seedlings indoors under lights until they are ready to be transplanted into the garden. If you have the time and want to give it a whirl, see 10 Steps for Starting Seeds Indoors for some tips. If you are short on time, purchasing transplants from a nursery or garden center is a faster way to get your garden growing quickly. 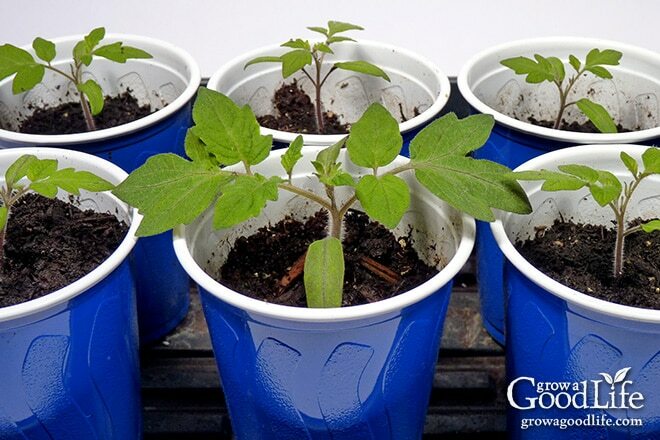 A $3 tomato plant will provide you with 10 pounds of fruit over the course of a growing season. Well worth the investment. 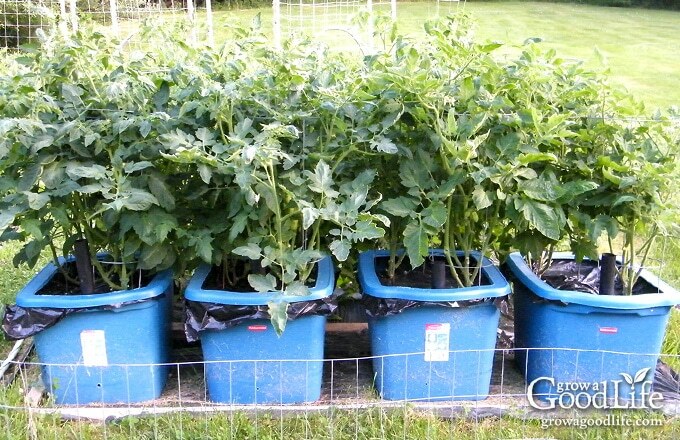 Grow in Containers: Growing vegetables in large pots on your deck or patio is an easy way to cultivate edible crops. Even if you have a garden, you may find that keeping additional containers around your yard is beneficial. You won’t have to do a lot of digging or weeding when growing in containers, but you will have to devote time to watering the containers because they tend to dry out quicker during hot spells. Use Self-Watering Containers: To solve the water maintenance issue, consider using self-watering planters. A self-watering container is made up of two chambers, the growing chamber and the water reservoir chamber. The growing chamber contains a wick that descends into the water reservoir that pulls water up into the growing chamber as needed for the plants. You simply fill the water chamber, and your plants will have water available to them for a longer period of time. Mulch the Soil Surface: Mulching your garden will help you save time in two big ways: weeding and watering. Mulch is any type of material that is layered on the surface of the soil. It helps hold in moisture and shades the soil surface preventing weed seeds from germinating. Organic mulches break down over time, enriching your soil as they decompose. Mulching helps reduce weeds, but you will still have to put some effort in weeding. Removing the weeds early when they are small is much easier than later when they are large. Use Soaker Hoses: Stringing soaker hoses around your plants takes some time and effort in the beginning, but they do make it much easier to deliver moisture directly to the soil surface and the plants. Adding a layer of mulch on top of the soaker hoses reduces the water evaporation. Teach your children the wonders of nurturing plants from seed to harvest. Give them tasks in the garden. A sure way of getting kids to eat more vegetables is showing them how to grow their own. Consider giving each child a garden bed in the family plot all their own. Help them plant what they want to grow and teach them to tend to their own little garden. Great crops for a kid’s garden include radishes, sugar snap peas, cherry tomatoes, bush beans, carrots, herbs, and flowers. Who knows? Once the gardening bug is planted, your children could become more helpful in the garden. Finding the time to garden is rewarding. I hope these tips help make your gardening time enjoyable and productive this year. Do you think you are too late to start your garden?